The fifth life priority in the HRVWE model is our mental and physical Environment. One of our key priorities, regardless of our purpose, is ideally to improve our physical environment, simultaneously with improving ourselves. We can’t keep our physical or mental environment as it was in the past. That option is fantasy, yet far too many of us remain psychologically attached to it, as a form of nostalgia. What we can do is increasingly learn to protect the complexity and sentience that needs protecting, while special parts of our physical environment, like our cities and technologies, transform at ever-faster rates, and in increasingly self-directed ways, whether we want them to or not. Human beings are both transformers and stewards of our environment, whether we recognize it or not. Fortunately, as our morality and foresight grow, those two roles are increasingly less in conflict. We can do both. The better we manage our environment, the more intelligent and antifragile it becomes, just like us, and the better it helps us to adapt. We’ll discuss environmental intelligence later in this chapter. Our environment can support our work or distract us from it. We all need some distraction, but most of us get far too much of it in today’s information-rich world. Five success codes that can help in managing your Environment are SOFSC. This stands for Selected, Organized, Functional, Simple, and Clean – five suggested priorities for building a great mental and physical environment. A mnemonic is “my SOFa is Simple and Clean.” Think of the sofa in Steve Job’s living room, or the napping sofas at Apple, a very design-conscious computer manufacturer. A great mental and physical environment is not random, it is carefully designed, and we think these five priorities are particularly important to good design of our living and working environments. A good design is carefully thought out. The first priority is selection. This has the greatest impact on the intelligence and usefulness of your mental and physical environment. Do you regularly select your thoughts and feelings? When you do, that’s called meditation, focus, or attention. Focus: The Hidden Driver of Excellence, Daniel Goleman 2015 is a good overview of the science of attention, and why it is so important to building experience, and becoming excellent at anything. If you stop paying attention to certain thoughts and feelings, they will steadily die out (neuroscientists call this “long-term depression“), and those good thoughts and feelings that remain will steadily grow, in both relative intensity and frequency. Slowly and surely, who you are will change. All your past learning, and all your subconscious thoughts and feelings, are the environment around your conscious, introspective mind, which is your core self. Often times we consciously know what we need to do, we resolve to change, then we subconsciously fall back into old patterns. For example, if you have relationship troubles, you may realize that you need to spend time, every day, being conscious of loving your partner and your children. If you consciously choose, every day, to give your partner and children love, in whichever of the five love languages work for you, those relationships will flourish. Neglect to do so, in too many circumstances, and you can fall out of any relationship. Conscious selection is the most important way we can improve every environment, whether it is mental or physical. What we must do, on a frequent basis, is select, or consciously choose, to think, feel, or do the right thing. Everything else then follows. See this lovely post by Athruz, Choose Your Partner Every Day, Or Leave Them, 2017, for some great advice. Be sure you are selecting, every day, what really matters, with your precious thoughts, feelings, time, energy and things. Do you regularly say no to opportunities, because they don’t fit your high mental selection criteria, and because you are generating so much value with the criteria you’ve presently selected? If not, consider changing your selection criteria. Most of us need to start by narrowing our criteria, especially once we’ve gained some experience and have a variety of interests. I highly recommend Greg McKeown’s Essentialism: The Disciplined Pursuit of Less, 2014, to help you on your selection journey. A foundation to great performance is to know what to cut out, in order to make more progress on what remains. How selected are the things you allow in your physical environment? Are your things an opportunistic assortment of stuff you randomly encountered, or could easily obtain in the past, or are they well-sought-out, well-chosen and well-kept? Everyone accumulates too much stuff, and occasionally has to winnow it down. I’ve rebuilt my personal library three times in my life so far, giving most of my books away. Marie Kondo’s great book on decluttering, The Life Changing Magic of Tidying Up: The Japanese Art of Decluttering and Organizing, 2014 is brilliant for this, offering a category-by-category approach to regularly re-selecting your physical environment, and asking: Does this object give me joy? If you don’t get that feeling from any your stuff, dump it. Start with your clothes, and see if you can lose a third of your wardrobe, and get back some of your closet space. Sell your things or just give them away, and focus on creating value instead. The name of a rapidly-growing website for used goods, LetGo.com, reminds us that the hard part of selling anything is the mental discipline to decide to let it go. Today it’s easy to buy, rent, or borrow it again later, if circumstances change. The hard part of owning things is knowing that you’ve selected the right things, and knowing what things to get next. What is your criteria for selection? Selection should flow from your values and vision for what you should be doing now. Many things are useful for a time, then it is time to let them go. This Guide recommends an evo devo approach to selection, using both evolutionary (creative, experimental) and developmental (protective, truthseeking) values. Will your things help you be more innovative, experimental, and imaginative (evo) or more safe, powerful, and evidence-based (devo)? If not, maybe you don’t need them. We also recommend keeping the Eight Skills and Ten Values in mind as you think about your things. The more consciously you select, the more your environment enriches your life. Take an evo devo approach to the selection process as well. Sometimes its best to relax and vary your selection criteria, experimenting and playing with new things, and sometimes you want to constrain and optimize them on useful things. Recall the cycles we mentioned under Health, and be sure to cycle between serendipitous and predictably focused states of being. The important thing with play, recreation, and fun is to know when you’ve had enough, when you are rested, recharged and ready to go back to focus your thoughts, behaviors, and environment on good work, and pursuing your visions. Give yourself a jolt of mental pleasure every time you catch yourself selecting your mental and physical environment in ways that reward your higher vision and values. Reward selection, and it will grow. Another challenge is organizing what you have selected. For organizing your mental life, it helps to have a model or models in mind. Find sources of schemes for organizing your mental environment, with its values, visions, and goals. This Guide is just one of many sources that can help in that regard. The Organized Mind, Daniel Levitin, 2015 is a good, if wordy, introduction to the value of being an organized thinker. Print out some of your favorite schemes and models and put them on your wall. As you organize your mind, you’ll start to organize your behavior. David Allen’s Getting Things Done, 2015 offers one excellent framework for organizing your information flows. Habits will also help you organize your life. Charles Duhigg’s The Power of Habit, 2014, will convince you of the value of building daily routines that you organize your home and work life around. Committing to certain routines motivates you to live more fully, and do more with every precious day. Don’t worry about losing your serendipity, creativity, or curiousity. You can keep growing those, even as you focus in on various routines. Change them up every so often. It’s good to have a number of possible routines competing against each other, as one will work better for a time than others. Consider using digital tools to help you with your routines as well. If you need to exercise more, wearing a fitbit will give you incentive to get those 10,000 steps in every day, and take a walk in the evening if you didn’t get them. Finding some great podcasts on your phone to listen to while walking can also be very motivating. We are in the last decade of still-dumb “smart” phones, and still-primitive wearables, so you’ll have to put in some effort to figure out how to use your digital tools well. There are some cool wearables finally coming out (2017), like the Oura Ring, a ring wearable that tracks sleep, movement, and heart rate variability. Be on the lookout for the best stuff, and reward innovation by purchasing the least-crappy products that are moving in the right direction in terms of size, simplicity, and smartness. Organizing your physical environment is also valuable. If you have physical books, you might organize them by topic area, which is perhaps the most useful, or simply alphabetically, as I do, which takes a lot less mental effort and lets you easily know where to find anything, using Amazon’s search, as long as you can remember one word of the title. Use whatever scheme works for you, but the important thing is to have a scheme, and use it. The futurist Kevin Kelly recommends making your stuff open to view as much as possible, rather than hiding it behind doors. In his garage, for example, he uses Uline stackable plastic bins, to keep all his tools in open view. His rationale is that if you can see everything, you’re more likely to know what you have, and use it more. If you can’t, it’s out of your mind, which can also be nice, and looks less distracting, but you won’t use it as much. Seeing all his stuff forces Kelly to decide regularly if he still needs it, and he regularly gives away stuff to create space for even more useful stuff in the future. Alternatively, you might prefer to keep everything visually hidden in cabinets, drawers, and opaque plastic boxes. That works well too, as long as your containers are labeled. But visually hiding things will make it more of an effort for you to regularly select and clear away stuff you don’t use, so just keep that in mind. The in-between choice, to stuff everything in translucent plastic storage boxes, without labeling it, is generally the worst option. It’s fine to use translucent boxes if you like to see the outlines of your stuff, don’t let that cause you to skip organizing and labeling it. The organizing process helps you to know what you have, and realize what you may still need, and don’t need. You’ll use organized stuff much, much more often, when it can help you most. Whether its tools or toys, books or bicycles, organization is its own reward, so do it. It’s easy to neglect organization, and it’s also possible to do too much of it. For mental organization, if you make too many plans, you’ll quickly discover a sharply declining number of them actually get done. For physical organization, if you are too quick to find a place for everything, and put everything away as soon as you’ve used it, your creativity and curiosity may suffer. A certain amount of messiness is conducive to inspiration, and is necessary for play and fun. So be sure to cycle between messy and organized states of being, both mental and physical. Be comfortable in both states, and know when it’s time to move to the other state. Do you understand the functions of the ideas, software and things you have selected and organized? If a thing has a hundreds of uses, we typically only think of a few of them. So much function, and so many potential applications, remain unappreciated. The better you appreciate the full function of everything you’ve selected, whether it is an idea or a thing, the better you can select and organize it. Like foresight itself, understanding possible, probable, and preferable function is a never-ending journey, but a core priority for building an adaptive environment. When you acquire them, take a little time to explore the uses of your things and tools online, in communities that work with them, and the professions around them. You’ll become a better curator and user of them as a result. Regularly browse catalogs of useful tools as well. Global futurist Kevin Kelly’s Cool Tools: A Catalog of Possibilities (2013) is my current favorite source exploring useful tools and their functions, and it is a great index to many other sources. Being a good student of function and maintenance will make your tools a more natural extension of your body, in the same way that your body is an evolved physical extension of your mind, which is your core self. Fighter pilots and paraplegics must learn to make their jets, and wheelchairs, a natural extension of their bodies. Advanced wheelchairs like Dean Kamen’s iBOT are truly empowering, as they give paraplegics functions like the ability to stand up, dance, and even climb stairs. The more we bring essential function to the folks who need it, the more we empower the world. Designers, for their part, need to remember the 80/20 rule, and its implications for interface design and education of function. We fail our public when we don’t make the 20% of features that everyone uses the most obvious features in the default interface for our software, and the first features we discuss in any brief video or text educating users about any tool. We need to hide the other 80% of the features in the background, so the tool is selected and organized for the most common or most valuable functions, by context. Most software and tools still don’t follow this obvious design aesthetic, and the world is poorer and less adaptive as a result. Wherever you can find it, reward this aesthetic by purchasing tools and software that are most faithful to it. Quality is another key attribute of function. Paying more for higher quality is usually better. Robert Pirsig’s Zen and the Art of Motorcycle Maintenance: An Inquiry into Values, 1974/2008, is a great fictional story on quality and related values, told as a summer motorcycle trip taken by a father and his son. There are times when it is better to save your money and work with shoddy tools, but there’s always a cost to low quality, in time and aggravation. If you skimp on quality, have a plan for replacing those poorer tools as soon as you can, to create more value with the work you are doing. Do you have the right tools for the job? If not, ask yourself what functions you truly need, and what functions you don’t. Pay for only the functions that matter, and by better designed, higher quality things whenever you can. The more consumers select consciously for great function, the more companies will prioritize function and quality as well. Strive to keep your mental and physical environment as simple as you can, while maintaining key function. Recall the famous quote, derived from a saying of Einstein about theory, that “Everything should be made as simple as possible, but no simpler.” Make it a priority to cut away things that aren’t helping you, either mentally or physically, so you can get more out of what remains, creating the present and future you want, for yourself and the world. The level of simplicity you select for will of course vary by context and function. Children’s environments, for example, should be physically rich, stuffed full of books and cool stuff to play with and think about. But even there you should be regularly selecting among your books and toys, recycling what no longer is useful, and adding new things for your children to engage with, and learn from. For yourself as an adult, consider the aesthetic in the phrase “Steve Jobs simple.” Steve Job’s apartment was spartan, with hardwood floors, selected for beauty, functionality, simplicity, and to keep him more awake as he walked on them, usually in socks. That’s an environment conducive to focus, essentialism, and transformation–of things other than his immediate physical environment. A big reason Apple computers have done so well with consumers is because they have always been more consciously selected than their alternatives. They pursued a less open strategy than their competitors, which hurt their early adoption and partnerships, but because they focused better on making their essential functions easier to access, and their interfaces as simple as possible, they became a a global leader in digital products. Apple has the opportunity to go a lot further in that aesthetic, too, customizing their simplicity increasingly as the AI behind digital products improves. Windows computers, in recent years, have been much less successful at this. They have gotten steadily more intrusive, taking away more user control with every new operating system. On Windows 10, you can’t delete stuff like Windows defender or OneDrive or Cortana if you don’t ever use them. They become harder and harder to simplify. Google’s chromebooks, by contrast, are a competing open system that is presently a lot less intrussive, though it is less powerful, and in the future it may deliver considerably more customized simplicity. In my book, the level of both intelligence and customized simplicity, much more than openness or closedness of platform, will be among the most important competitive advantages for most digital products and services. As the intelligence of any product grows, it will naturally become more selective in the way it interacts with consumers. That selectivity can be considered a kind of “closedness”. The more fine-grained and context appropriate its openness or closedness, the better the product or service becomes. Do you have an attic or storage shed for the low-use stuff you still might occasionally need but can’t yet part with? Getting it out of your daily environment is both mentally and physically liberating. Don’t pay for off-site storage if you don’t have to. Build or buy a shed, get some watertight plastic boxes, make an attic access, or figure out another place that gives you space for unused things. Regularly look those unused things over, and thin out the collection. Take frequent breaks when you are selecting. Each time you are on your break, contemplate how you’re going to select, organize and simplify what you have left. Once you’ve selected, organized, function-checked, and simplified your environment as much as you can for the appropriate function, the last big priority is to regularly clean it. Cleaning is itself an opportunity to meditate, and appreciate what you have. A clean desk, room, or house is a small opportunity to reset. Just as every morning begins as a new opportunity, every cleaning opens you to learning new things, to starting your Do loops again. It’s certainly possible to spend too much time cleaning, and you should be aware of declining returns while engaged in it, but most of us spend too little. Budget a certain amount of time, on a regular basis, to clean up, then enjoy the process, and the peace and openness you get as an end result. Again, we humans are constantly engaged in a process of environmental transformation and stewardship, a process biologists call niche construction, to make our world more hospitable to life and intelligence, for all species. Think of a spider’s web, a beaver’s dam, or a city for some good examples. Tomorrow’s smart agents and sims are both another major kind of niche construction, as well as a personal extension of ourselves. Clearly, the more intelligent and moral we get, the less we will try to disrupt our physical environment. Since the 1960’s sustainability values have been growing, and that’s a great thing for our planet. But it’s an easy mistake to assume that nature as we know it will continue as we’ve experienced it for the last few million years. Nature’s nature is to constantly change, and to build intelligence, which in turn increasingly changes our environment and ourselves. In the future, we will be increasingly able to offer all other sentient beings the opportunity to voluntarily and reversibly transform themselves, using advanced technology, into something more than what they are today. If they don’t like their new state, they’ll be able to go back to their original state. But would they? Most sentient beings would jump at the chance to live longer, and have more capabilities and consciousness. For the vast majority of biological beings, upgrading their abilities will be a one way trip of transformation, to a more intelligent and immune future. 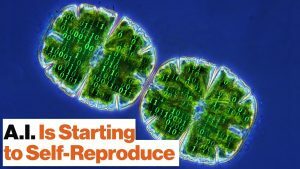 Consider than in a future world where our intelligent machines know how to offer genetic transformation, many partly sentient animals would voluntarily upgrade their intelligence and consciousness, a predictable outcome that futurist David Brin calls “uplifting“. Brin offers several compelling scenarios for uplifting in his science fiction works. This future will happen, as a humanitarian project, regardless of what visions we have of creating a “sustainable biological world” on our planet. The nature of nature is to continually change, and improve, regardless of any nostalgic visions we have of a perpetually biological Earth. Once human-surpassing AIs emerge, we can expect all of biology to be increasingly studied, predicted, and uploaded into a much faster, more intelligent, and immune substrate, than that of postbiological life. Once future sentient species have a choice, don’t expect them to stay as they are. You wouldn’t. Why should they? Will our future children even reorganize our planet’s space, time, matter and energy themselves for computation, as the transcension hypothesis and a variety of transhumanist scenarios have argued? We shall see. One thing is clear: our environment is constantly being modified by us. We all should have a future vision for our environment, and a number of guidelines for continuing to improve it. Hopefully these will help you a bit in that regard.